Supply concerns kept oil prices near high levels not seen since November 2014 on Tuesday as ongoing production cuts led by OPEC helped support prices. “The commitment of Saudi Arabia and the rest of OPEC to the production cuts is a major factor in supporting the price at the moment as well as the possibility of reduced exports from Iran due to sanctions,” William O’Loughlin, investment analyst at Rivkin Securities, told Reuters. U.S. West Texas Intermediate (WTI) crude futures were at $71.09 a barrel, up 13 cents and also not far off their November 2014 high of $71.89 a barrel reached last week. Asian shares retreated on Tuesday after surging in the previous session. MSCI’s broadest index of Asia-Pacific shares outside Japan dipped 0.65 percent after rising the previous day to its highest since late March. “The markets appear to be taking a breather after their recent surge, awaiting fresh developments in matters such as U.S.-China trade issues and Washington’s upcoming summit with North Korea,” Yoshinori Shigemi, global markets strategist at JP Morgan Asset Management in Tokyo, told Reuters. 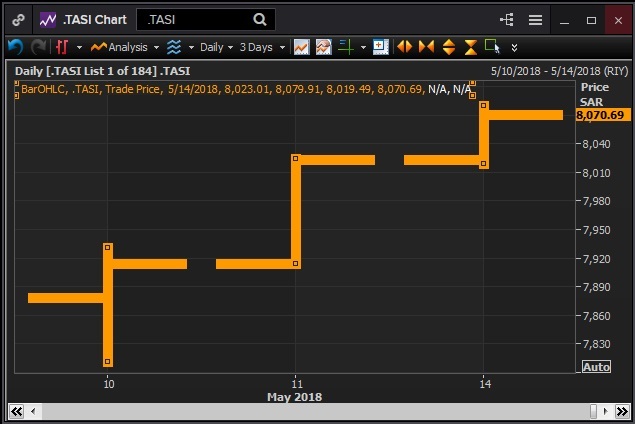 The Tadawul index has nearly added 2 percent this week on hopes of a possible upgrade of Saudi Arabia to MSCI’s emerging market index and as good levels of oil prices supported the world’s biggest oil explorer’s stock market. Markets in the Middle East were mixed on Monday. Qatar’s stock market added 1.3 percent as Qatar National Bank added 3.4 percent and Industries Qatar rose 2.7 percent, with investors hoping that index-compiler MSCI will increase weightings for some of the country's top blue-chip companies in its emerging market index review. Saudi Arabia’s index added 0.6 percent as Al Rajhi Bank added 1.3 percent and Samba Financial Group gained 1.7 percent. "We expect Saudi to do well in the run up to the MSCI announcement – the index closing above the 8000 mark is a healthy sign and we see retail as well as the opportunistic foreign investors to come in," said Vrajesh Bhandari, a portfolio manager at Dubai-based Al Mal Capital, told Reuters. "Banks reported good set of numbers. Going forward, we expect the sector to witness better loan growth post summer as well, benefiting from the substantial base of non-interest bearing deposits in this context of higher interest rates." Dubai’s index added 0.5 percent, as Emaar Properties rose 1.2 percent. Abu Dhabi’s index rose 0.5 percent, as Etisalat rose 2.2 percent. Egypt’s index fell 1.2 percent, Kuwait’s index fell 0.5 percent while Oman and Bahrain’s indices were flat. The dollar was trading higher early on Tuesday as U.S. bond yields surged on easing trade tensions between the United States and China. The dollar’s index versus a basket of six major peers rose about 0.1 percent to 92.647, pulling up from 92.243 on Monday, which was its lowest level since May 2. Gold prices were little changed on Tuesday as a stronger dollar limited gains in safe havens. Spot gold rose 0.1 percent to $1,314.24 per ounce at 0056 GMT. Egypt's Central Bank Governor said foreign inflows had exceeded $120 billion since its pound currency was floated in November 2016, state newspaper Al-Ahram quoted him as saying on Monday. For access to market moving insight, subscribe to the Trading Middle East newsletter by clicking here. Please click here to gain a deeper understanding of financial markets through Thomson Reuters Eikon.